Social housing rent: How high is too high? Construction is progressing rapidly at 1099 Richards, a development the City described at a public hearing as “100% social housing” and therefore worthy of additional density in excess of local zoning bylaws. In addition to the 87 units that will simply replace the 87 units currently at Jubilee House, this building will also contain 75 “low end of market” units. These units are tiny: 34 studio apartments are 320 sq. ft.. The 41, 1-Bedroom units are 350 sq. ft., for an average size of 336.4 sq ft.
Average rent is $1142 / month for these “low end of market” “social housing” apartments. Not a tiny amount. How costly is this on a per-square-foot basis? $3.39/sq. ft. monthly, or 40.74/sq. ft. annually. Let’s compare this rent to other apartments in the area on a per-square-foot basis. We checked Craigslist, which on Aug 24, 2014, listed an 883 sq. ft. apartment directly across the street from 1099 Richards. This fully furnished Yaletown apartment rents for $2350/mo. That’s $2.66/sq. ft. monthly, or 31.94/sq. ft. annually. 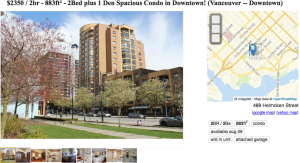 On a price per square foot basis, the 1099 Richards “low end of market” City-defined “social housing” is 27% more expensive than a fully furnished New Yaletown apartment across the street! To see if this is just an anomaly, we checked out another listing for another data point. This 1400 sq. 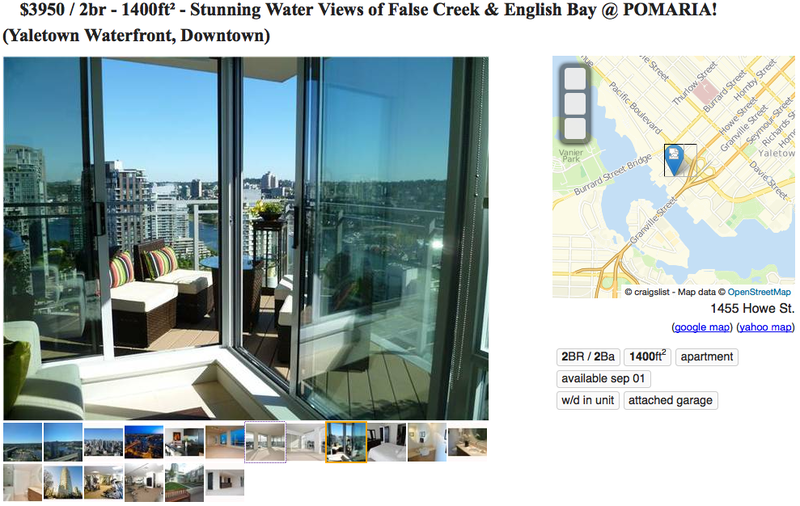 ft. luxury apartment with water views rents downtown for $3950/mo. That’s $2.82/sq. ft. monthly, or 33.86/sq. ft. annually. 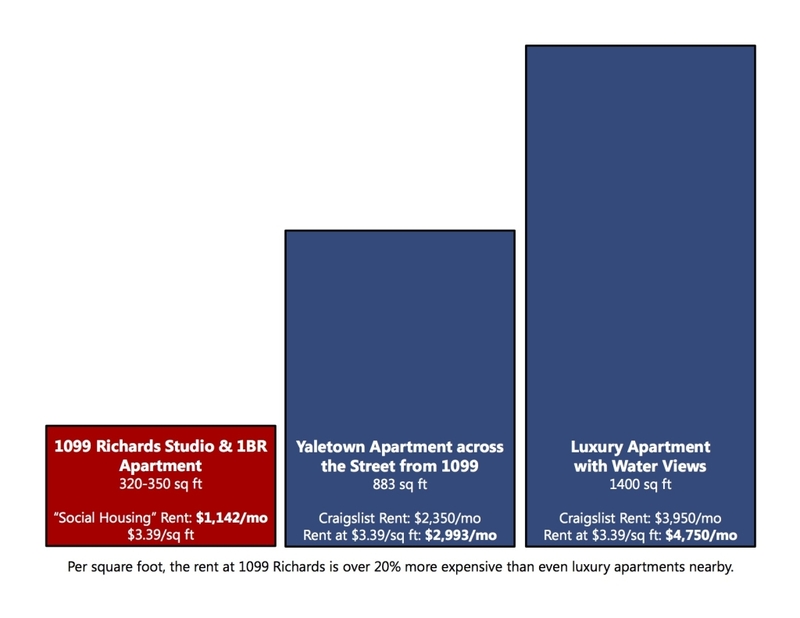 On a price per square foot basis, the 1099 Richards “low end of market” City-defined “social housing” is 20% more expensive than a downtown luxury apartment with water views! Or being lured into giving density bonuses to a developer who is charging luxury rents for “social housing”? Should the developer Brenhill be earning luxury-rate profits from so-called social housing? Share your thoughts on Twitter, and with the Mayor and Council.